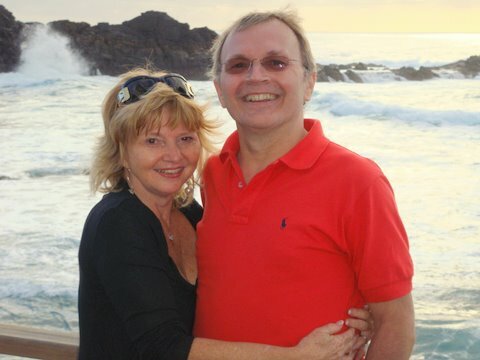 As a semi-retired financier living with his wife on the Isle of Man, Andrew Ashworth is used to frequent travels around the world. Rochester, Minnesota was not on his map until Spring 2009, when he visited a local hospital on the British island for a stomach complaint. He suspected gallstones, which his doctor did find, and then some. Andrew learned that he also had advanced bladder cancer and that he needed a radical cystectomy - removal of the entire bladder. Soon after receiving his diagnosis, Andrew was introduced by a friend to Mayo Clinic in Rochester, where he arrived with his wife in June 2009. They were greeted by an international coordinator who guided them to his various appointments and tests that he completed in less than three days. “The efficiency of the testing added to the clarity and the confidence we had in Mayo Clinic,” Andrew said. He then went over the results with urological surgeon, Dr. Jeffrey Karnes, who confirmed the diagnosis of advanced bladder cancer. Dr. Karnes prescribed a preoperative chemotherapy regimen and scheduled Andrew for a nerve sparing radical cystectomy three months later. “He told me that his options were the creation of a neobladder or an ileal conduit at the time of the surgery for his choice of reconstruction”, recalls Andrew. Andrew and his wife Trish returned to Mayo in late September, and he was scheduled for surgery on October 1, 2009. Although Dr. Karnes was confident in the successful creation of a neobladder, there was still a risk that he would need an ileal conduit and a bag at his side for the rest of his life. Andrew said that the Mayo team prepared him not only for the clinical part but for the psychological aspect of his care, too. “They took care to ensure we understood that there were no promises in this game and that they would do what was possible; however, in the worst case, I would wake up with not what I wanted, but what was necessary, and I appreciated it” said Ashworth. The procedure was successful, and he woke up with a neobladder. Aside from neobladder surgery, Andrew needed his gallbladder removed, and this was dealt with in the same surgical session. “For clinicians and surgeons to have this collegiate approach is hugely admirable,” Andrew says. “The whole idea of having doctors and nurses who don’t just live for stardom was very evident and is a credit to Mayo Clinic that goes all the way back to the two Mayo brothers and their father more than 100 years ago”. The recovery has gone well. “A year ago I had advanced bladder cancer. Here I stand, the operation done, fully recovered, just a few scars to show for it, says Andrew and adds: “I was lucky enough to have excellent healthcare, and lucky enough to get through the operation as well without side effects. Perhaps it happens to many people, but having an incident like this in your life changes your focus. I've always been a bit of a workaholic. An incident like this, where you're almost staring death in the eyes - it does make you live for the moment. You value friendships, you value the time of the day. It's very easy to overlook enjoying yourself." This story was written by L. Rothering, an intern, and D. Anastasijevic, a communications consultant, in the Department of Public Affairs at Mayo Clinic in Minnesota.